U.S. Commerce Secretary Penny Pritzker named Momentum Group a 2016 recipient of the Malcolm Baldrige National Quality Award, the nation’s highest Presidential honor for performance excellence. Momentum is recognized for its outstanding commitment to sustainable excellence through innovation, improvement and visionary leadership. The Commerce Department’s National Institute of Standards and Technology (NIST) manages the Baldrige Award in cooperation with the private sector. Award applicants are evaluated rigorously by members of an independent board of examiners in seven areas defined by the 2015-2016 Baldrige Criteria for Performance Excellence: leadership; strategy; customers; measurement, analysis and knowledge management; workforce; operations; and results. The Malcolm Baldrige National Quality Award (MBNQA) recognizes U.S. organizations in the business, healthcare, education and nonprofit sectors. The Baldrige Award is the only formal recognition of performance excellence of both public and private U.S. organizations given by the President of the United States. The MBNQA was established by the Malcolm Baldrige National Quality Improvement Act of 1987. The award was named for Malcolm Baldrige who served as United States Secretary of Commerce during the Reagan administration, from 1981 until Baldrige’s death in 1987. Ronald Reagan said, “The economic liberty and strong competition that are indispensable to economic progress were principles that "Mac" Baldrige stressed.” During his tenure, Baldrige was an advocate of quality management as a key to U.S. prosperity and sustainability. He played a major role in developing and carrying out administration trade policy. His award-winning managerial excellence contributed to long-term improvement in economy, efficiency and effectiveness in government. Today, the Baldrige Program is dedicated to help organizations achieve best-in-class levels of performance, identify and recognize role-model organizations and to identify and share best management practices, principles and strategies. To date, more than 1,600 U.S. organizations have applied for the Baldrige Award, and there are more than 30 independent Baldrige-based state and regional award programs covering nearly all 50 states. Internationally, the program has served as a model for nearly 100 excellence programs. In addition, many organizations such as Momentum use the Baldrige framework for improvement and innovation strategies within their organization. “The Baldrige framework gives us a structure to improve all aspects of our business each year. This approach has been critical to our consistent positive results,” said Roger Arciniega, Chief Executive Officer. Momentum has been invested in continuous improvement since 1991. The Baldrige Performance Excellence framework is the underpinning to the company’s journey and progression. In the 1990’s Momentum set the foundation for its Quality Process Improvement System through initiatives such as forming a quality leadership team, developing action teams for problem solving, providing all employees with quality training, benchmarking and implementing a best-in-class recognition program. During this time, Momentum applied for and won the California Award for Performance Excellence (the state Baldrige Alliance member in California) at the Bronze and Silver levels. It was during these early years that the Baldrige criteria became an inherent part of Momentum’s culture. After winning two state awards, Momentum adapted the spirit of competition through its Internal Baldrige Award program (IBA) using the Baldrige Performance Excellence Program to develop criteria for performance evaluation. The IBA is an annual review process where all 11 workgroups (six core processes and five support processes that include all employees) submit an internal Baldrige-based application to an outside reader. Momentum has hired a national Malcolm Baldrige examiner for the past 16 years to evaluate each of these internal applications. The IBA has been the vehicle by which Momentum has been able to successfully deploy its quality process to every employee in the organization and align individual activities to Momentum’s strategic plan. The IBA process has undoubtedly spurred employees to take innovation to the next level and continuously improve their processes. One standout innovation is the Silica family of products. 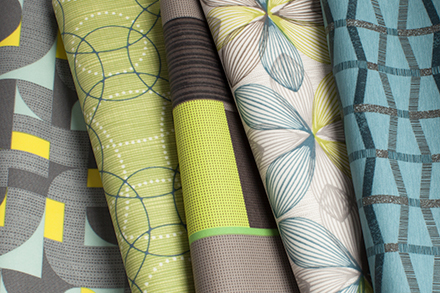 Silica has won numerous awards: Best of NeoCon Gold, Nightingale Award and IIDEX. The product is a revolutionary, sustainable coated fabric alternative to vinyl that performs so well even a permanent marker can be wiped off with water. It has become Momentum’s best selling product. 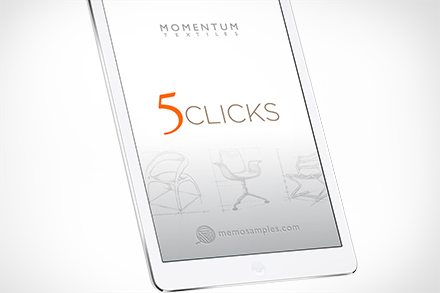 Another breakthrough innovation in service is Momentum’s website feature, 5 Clicks. It provides a path to certainty offering fabric selections that are pre-approved by the leading furniture manufacturers, by price point and inventory levels in five quick steps. The feature is so widely used that they created one of the industry’s first apps now available for both Android and iOS users. The 5 Clicks app has become an industry standard tool for dealers and furniture manufacturers, making thousands of pre-approved fabric selections available on any smart phone any time. After more than two decades of continuous improvement and product refinement, Momentum applied for and received Gold in 2015 from the California Award for Performance Excellence. “It was after seeing the tangible benefits of writing a 50 page application, undergoing a week long rigorous site visit with eight examiners, and seeing how proud our employees were to be recognized at the highest state award level, that we decided to apply for the Malcolm Baldrige Award,” said Patricia Dominguez, Director of Strategic Process Improvement. As an award recipient, Momentum Group is in good company. Since the first Baldrige Award recipients were recognized in 1988, 106 awards have been presented. Past award recipients include Motorola, Xerox, Milliken, FedEx, IBM, Cadillac, Ritz-Carlton, AT&T, Corning, 3M, Boeing, Caterpillar, Honeywell, Nestle and Lockheed Martin. 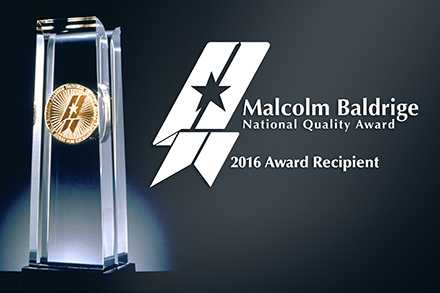 The Malcolm Baldrige Award will be presented to the recipients at an April 2017 ceremony during the Quest for Excellence conference in Baltimore, MD.